Members of the East Jordan Shoe Club participate in Real People Media's week-long Video Boot Camp producing a program on the Jordan River. Real People Media has partnered with and/or provided instruction to numerous nonprofit organizations, groups and individuals throughout northern Michigan. These partners have used this knowledge to produce informative programs for their members and for the public. Check out their stories! Real People Media can help you, or your organization, tell a story! We provide training and classes in all types of storytelling. We understand that people express themselves in all different ways. We can help you find YOUR way! Check our schedule periodically, subscribe to our e-newsletter or send us an email to start the conversation. 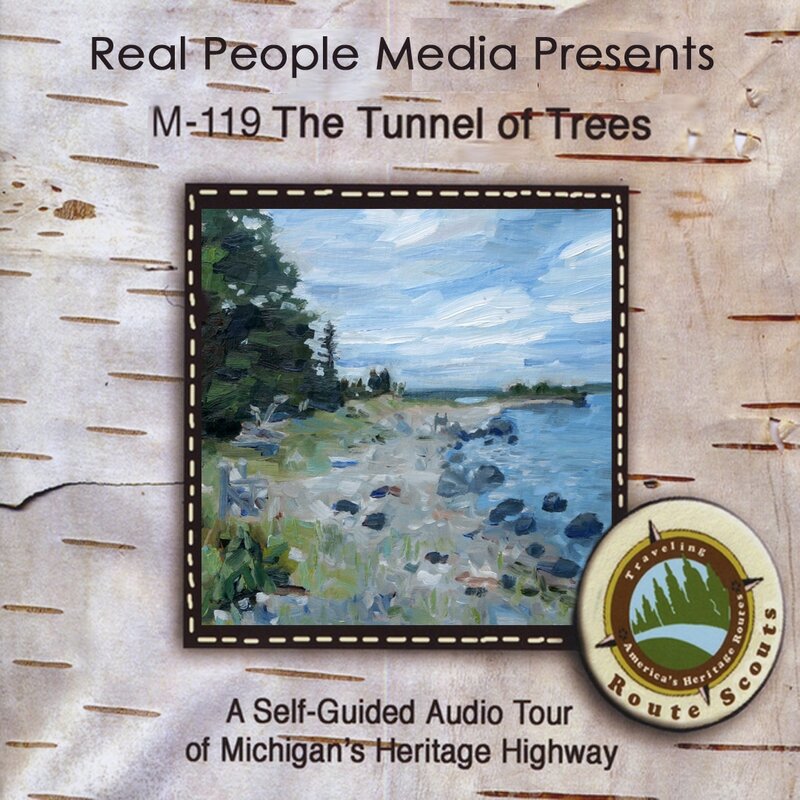 Real People Media produced this audio tour of one of Michigan's favorite roads, M-119. RPM recorded the interviews, provided free editing services, and added musical selections from northern Michigan musicians to create an entertaining and educational tour that can be enjoyed by the entire family. "Come with us on a 28-mile journey along M-119, one of Michigan's most beautiful highways. On this 75-minute tour, you'll learn about Chief Petoskey, the formation of Little Traverse Bay, local history and stories from the people who live here." Fifth Street Sessions, J.Bransky, A Rockwood, http://cdbaby.com/cdbranskyrockwood. ECR took part in Real People Media's Video bootcamp in June 2018. During the two-day workshop the participants created this video to show how plastic bags can be recycled and made into decking. 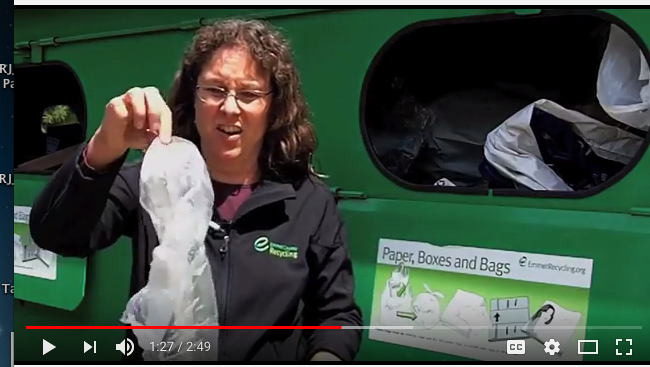 The video also helps explain what types of bags can be recycled. The video is currently being used on their website and promoted via social media. Watch the video by clicking on the photo above. Tip of the MItt Watershed Council's Communication Director, Kristy Beyer along with student interns obtained instruction in video production through our video bootcamp and documentary storytelling workshops. They used their skills to produce numerous programs for the organization. "Dear Rebecca, I would like to thank you and Real People Media for your support over the past two years. Thanks to the classes that you offer and the equipment that is available to use through your organization, we have been able to produce many educational videos. We couldn’t have done it without you. We look forward to working with Real People Media in the future." The Sault Environmental Club is an after school program at the Sault Ste. Marie High School. The club chose to produce a video as part of their project. They contacting Real People Media to help. Real People Media facilitated the making of this video by providing video equipment and training to the 8 participants. The program was conceived, shot and produced by the high school students who worked together on the project. Above is the finished video. Below is a behind-the-scenes look into making the above video. Check them out! Real People Media worked with five members of the East Jordan Shoe Club during a one-week video production "Boot Camp" to produce this program on the Jordan River. Shoe Club participants (all going into the 8th grade) created interview questions, a shot list, operated the camera and conducted the interviews. "hi its teddy!! the video turned out GREAT! "Teddy N - Boot Camp Participant"
Thorne Swift Nature Preserve Manager, John Riggs needed an educational video to share with visitors to help instill appreciation for the preserve and keep visitors from walking into sensitve areas. With Real People Media's help, John created a video to show young naturalists how to "Walk in the Woods" and enjoy and protect the preserve's natural wonders. The video features pitcher's thistle, sundew, jack-in-the pulpit, poison ivy, white-tail deer and more. Thorne Swift Nature Preserve is located north of Harbor Springs, Michigan - off M-119. The video is for young children - adults. Real People Media helped the Bergmann Center of Charlevoix, MI produce a talk show called "The Bergmann Buzz." The show was produced by clients of the Bergmann Center with assistance from Real People Media staff. In this episode host, Eric Chojnacki interviews Kim Brock about the upcoming Bergmann Center Fundraising Auction on May 5, 2013. The Mission of Bergmann Center is to provide services that enable mentally and physically challenged individuals to become active involved members of the community. Real People Media occasionally produces programs ourselves. We felt Linda Weston's exhibit, 30 Hats in 30 Days, featured at the Charlevoix Circle of Arts was a culturally important exhibit which needed sharing. The exhibit featured 30 traditional hats from the Linda Weston Collection, which represented 6 continents. Information about the hats and the countries from which they came were displayed. Countries represented include: Bali, Pakistan, Mali, Australia, Hungary, Vietnam, Costa Rica and many more! The video was recorded by RPM intern Rick Beemon. "I have personally seen the very positive effects of the work of Real People Media in our community, from the perspective of both nonprofit organizations and from the perspective of individuals as well. Currently Rebecca Glotfelty, executive director of RPM is personally training a group of student volunteers (from ages 16 to 56) from the Petoskey District Library, in how to use RPM's video and sound equipment to produce a television show featuring the talents of the people involved in Petoskey District Library's three separate readers theatre groups. Real People Media offers opportunities for local artists as well as arts and cultural organizations to perform for the community via the electronic media in ways that neither individual artists nor small nonprofits could ever afford on their own. Both individual artist and arts organizations are nurtured through the work of RPM." - Dale Hull, President of the Petoskey District Library. Hayes Township resident, Anne Kantola, enlisted RPM assistance to create a a video to help preserve Camp Seagull for the public. Art in Rural Communities Presented by I.S.L.A.N.D. Real People Media taught video production skills to twelve students at Charlevoix's Northwest Academy for a semester. Students were given the assignment to produce a video portraying a "hero" These videos were entered in "Sony's "My Hero Contest" The above video by one of the NWA students was one of ten national finalists. Although the video below about Steve Jobs was not a finalist, it is very entertaining and well executed. Check them out. Good job students!